If you find yourself undertaking a renovation, demolition, or a construction project, you are going to need an effective means of storing debris and refuse from your project. While some people may think that a simple answer to this scenario would be to just heap up all of their scrap and waste in one of the far corners of their lot, this is not prudent. Not only is doing so unseemly and unsanitary, it also has the evident potential to create various safety and health risks as well. Simply Rent a rolloff dumpster and keep community clean. Whenever you find yourself executing a renovation, demolition, or a construction project, the most sensible solution for your waste management needs should be to obtain a rolloff dumpster. We know that this might seem like a daunting task; so here is, a guide for you, the typical homeowner, on how to rent a dumpster in Orlando Florida. This is the probably the most important and most fundamental principle when it comes to renting a dumpster. For the average Orlando homeowner this is usually the most uncertain and frustrating part of the rental process. On one hand some people find that they underestimate the magnitude of their waste and end up renting a container that is far too small. On the other hand some people find that they end up “wasting” money by overestimating the magnitude of their waste and renting a container that is far too large. Different rental companies will have containers that have the same volume but different dimensions, take a look at our dumpster sizes here. 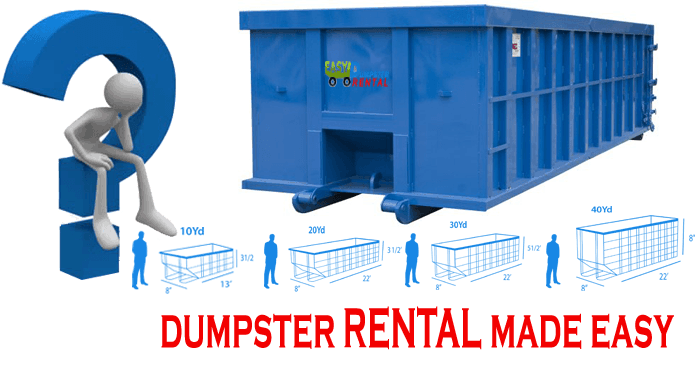 The general rule of thumb among contractors and reputable rental companies is that if you think that you need a dumpster of a specific size, then you will most likely really need a rolloff dumpster that is a size larger. Thankfully we provide a free to use dumpster calculator so that you can make an accurate choice. It really doesn’t matter if your rental dumpster is going to be placed on your property or in the street, you should always maintain an adequate amount of free space in front of the container (and if possible all around it). This is necessary to ensure that any trucks that needs to pick up said container can get in and out fast and easily and also so that any dumping of waste into the container can be done without any hassle. If your rolloff dumpster is going to be placed in the street, an effective means of reserving space for potential pick-ups is to use traffic cones and/or barricade tape. This principle is especially important if your dumpster is going to be placed in the street instead of on your property. Agencies such as your local building permit office or your local parking enforcement office will most likely come into play. It is always recommended that you try to get the necessary permits as soon as possible before you get underway with your dumpster rental. Additionally, if your street falls under the jurisdiction of a neighborhood association then you should notify them of your project and the potential placement of your container. Even if you don’t necessarily need their approval (which you most likely will) it is still best to notify them as a formality. Those are the main principles, related to just how to rent a dumpster in Orlando, that you should keep in mind if you decide to go about obtaining a rental dumpster. It is also recommended that you get yourself familiar with certain industry terms and phrases, such as: roll-off, yarder, and container. While this is not a necessity, it will allow you to better communicate and convey your thoughts and needs to the other individuals that you will have to interact with. Give us a call today or request a free quote from us and see just how we can make rolloff dumpster rental easy for you.